And it’s back to the Austen. I hadn’t touched an Austen novel in six months, and that was a grave mistake. My score card on my Austen travels is dreadful: Pride and Prejudice and Persuasion much loved but read years ago, and Sense and Sensibility and Emma read back in 2012, but no post written on either of them. And here I was with two Austen novels to go, and two extra books to read (A Jane Austen Education, by William Deresiewicz, and Why Jane Austen? by Rachel Brownstein). I had to regain my Austen footing fast, not least so I could rewatch The Jane Austen Book Club (2007) without fear of spoilers. 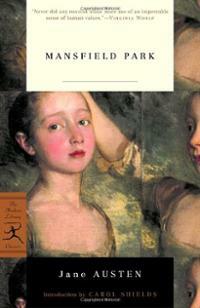 I must admit, I picked up Mansfield Park without much enthusiasm. I had heard that it was the dullest of the six novels, and despite the fact that Fanny Price was Austen’s favorite heroine, that she was also the most annoying character in English literature. I wish I could remember where I had heard the latter comment, since 1) I would say Sue Bridehead, from Hardy’s Jude the Obscure, is the most annoying character I have yet encountered in English literature, and 2) I found myself very drawn and sympathetic towards Fanny. The novel is surprisingly fast-paced considering it is much more introspective than its more action-packed cousins Sense and Persuasion, and its heroine considerably more down-trodden than other Austen heroines, even the abused Anne Eliot of Kellynch Hall. What sets Fanny Price apart? There is the obvious lack of confidence, of a measured sense of personal justice, and of liveliness, all qualities easily found in Elizabeth Bennet and Emma Woodhouse, and even in the quieter Elinor Dashwood and Anne Eliot. Fanny is shy to the point of displeasing her cold and/or irritable relations, and although she is able rightfully to find fault in others as she matures, rarely is she able to voice her admonitions and protests aloud. She is abused time and again, sometimes to almost comic effect (I am thinking of the episode of the rose-cutting errand); she is physically weak, a characteristic belonging to none of the other heroines I have encountered. Fanny is constantly misunderstood and, to the end, is unshaken in protecting the family secrets from the family itself, to her own detriment and fresh rounds of emotional pain. These meek characteristics often do not serve her well, and they guarantee that many characters in the novel, such as Edmund and Sir Thomas, remain deceived about the relationships between the Bertrams and the slick young Crawfords. How could such an excess of docility be excused: at the risk of sounding like a querulous and downright cruel Aunt Norris, what could Austen love about this timid little girl? Thankfully, I am no Aunt Norris. What struck me from the get-go was Fanny’s deep humility. What saves her from ever being exasperating is the fact that she genuinely desires her family’s good before her own: she is never resentful, never reproachful, and yet has every right to be both. She laments not being able to denounce the improprieties she witnesses to the male figures she admires and respects, but she refrains from exposing the wrongdoers solely because she thinks it will do more harm than good. Subtly, slowly, Austen leads us to prize Fanny’s mildness, restraint, and control, and to mistrust the very quality we admire in many of her other characters: liveliness. Of course, figures like Mary and Henry Crawford could never be compared to the lively Lizzy Bennet because they are lively and light of mind as well as deportment. They are careless, and think only of their own pleasure; although they are not malicious, they lack compassion, an almost equal sin to malice in Austen’s world. We could never accuse Lizzy of allowing her merry character to overcome her sense of propriety or her humanity. Perhaps this is why I had so much trouble with Emma; the pretty, airy Emma Woodhouse comes too close, in my opinion, to sharing the abominable carelessness of the Crawfords, made abominable only because it is so insidious, folded as it is between charm and a sanguine, actually friendly and benign nature. Miss Crawford is Fanny’s foil because, while neither are hateful characters, Miss Crawford’s character is “spoilt” when held up to Fanny’s. With all her privileges of education, beauty, a likable character and a superior mind, Mary is calculating, unfeeling, superficial, and ultimately self-destructive. Consciously or unconsciously, she is unable to ruin the happiness of the steadfast Fanny, and instead ruins her own chances for marital felicity. Mary and Fanny’s fates bring to mind my favorite Austen quote of all: In Pride and Prejudice, Elizabeth tells the wildly happy, newly-engaged Jane that, despite her wishes for her younger sister’s equal felicity, “Till I have your disposition, your goodness, I never can have your happiness” (page 300 of the Bantam edition). I have thought long and hard over those words. I love Elizabeth Bennet; I love her sound mind, her wit, her occasional tempestuous leanings. What could it mean that Jane Bennet, endearing, yet not particularly inspiring in terms of character, would have a happiness her more admirable sister could never have? Although the answer is up for interpretation, I think I am beginning to understand why the wise Jane Austen may have admired Fanny even more than the commendable Elizabeth. Fanny is admirable precisely because her virtues are not overt; they bring her few admirers, and not a little bit of trouble. She is noble, and even her overt faults, such as her excessive self-deprecation, fade away in light of the maturity beyond her eighteen years, and her desire to help others. She has the constancy of the older and more experienced Anne Eliot, and the goodness of the better-loved Jane Bennet. Yet unlike them, Fanny only finds recognition and comfort in one person, Edmund. As we read, we wonder why Fanny’s virtues bring her so little benefits, and her mild faults so much distress. We must remember, then, that Austen does not excuse away her heroines’ flaws; she embraces them. Austen makes a point of noting that Fanny would have been vulnerable to the advances of Henry Crawford, with all his gross imperfections of character, were it not for her existing love for Edmund. She tells us that she has no inclination to believe Fanny “an unconquerable young lady of eighteen…never to be persuaded into love against their judgment by all that talent, manner, attention, and flattery can do” (pg. 199). I can’t stress the importance of that passage enough. We are not supposed to walk away, rolling our eyes at Fanny the goody-two-shoes; Fanny is only saved from an undesirable match by her love for another. The mistakes and repentance of Austen heroines speak volumes of their characters, and are integral to each of the novels. Fanny’s mistakes come in the form of her inability to stand up for herself, and perhaps also in an overzealous guarding of family secrets. And it is that vulnerability and tenderness of disposition, the very qualities that Fanny’s authority figures berate her for, that actually makes Fanny endearing to Austen, and to us. What most disturbs me about Mansfield Park is the slippery nature of language. Supposedly non-reproachable figures such as Sir Thomas, and even the benevolent Edmund, are often greater causers of pain for Fanny than the more flawed characters. Sir Thomas’ reproach in the east room is the most brutal scene in the novel, and, in my mind, the pain and suffering he later experiences over his daughters’ fates do not sufficiently make up for it. Even Edmund, who has directed Fanny’s growth and education since childhood, who cares about her and (mostly) does his utmost to guard her comfort, continuously talks himself out of guilt for his occasional slip-ups of conduct. He lets Miss Crawford ride Fanny’s horse all morning; he abandons Fanny in the wood for over an hour; he talks himself into believing Mary Crawford’s improper behavior and speech is not so very bad as it seems. And even by the end, he is inclined to make excuses for said young lady, and never understands the true nature of Mary and Henry’s treatment of Fanny. Here is no humbled Darcy, no repentant Edward Ferrars. What does it mean that the kind and respectable Edmund never quite gets to the bottom of the Crawford story? The only answer that satisfies me is Fanny’s charming protest to Henry, later in the book: “We have all a better guide in ourselves, if we would attend to it, than any other person can be” (pg. 357). Unlike every other character in the book, despite the trials of her sad childhood, her painful adolescence, and her trying beginnings of adulthood, Fanny always attends to her own inner compass, her own sense of right and wrong. She is never persuaded otherwise. She is not supposed to be a “perfect” character incapable of fault or of generating our interest. But perhaps she is as close to an ideal model of nobility as Austen ever portrayed. This entry was posted in Austen Challenge, Literature and tagged Jane Austen, Mansfield Park. Bookmark the permalink. I still think Madam Bovary is the most annoying character in literature, although I suppose she’s not English, so she isn’t really in comparison with Sue, who IS pretty annoying.